Metal Gear Solid V: The Phantom Pain is the fifth game in the Metal Gear Solid stealth-action franchise, released by Konami in 2015. In MGS V, you control the character Big Boss as they vengefully search for the person responsible for the destruction of their paramilitary organization in locations such as Afghanistan and Angola. Like Dishonored and Hitman, MGS V attempts to facilitate both a non-lethal, stealthy playstyle and a lethal, loud playstyle. This video picks up from my own personal save file, where I had been playing in a mostly stealthy, non-lethal way, and so I had already unlocked a lot of equipment that made playing in that way easier. This includes things such as a non-lethal assault rifle and a tranquilizer sniper rifle, both of which are used in the video. This video takes place in a ruined palace area in Afghanistan and all of the combatants besides Big Boss and his trusty dog sidekick D-Dog are the Soviet occupying forces. 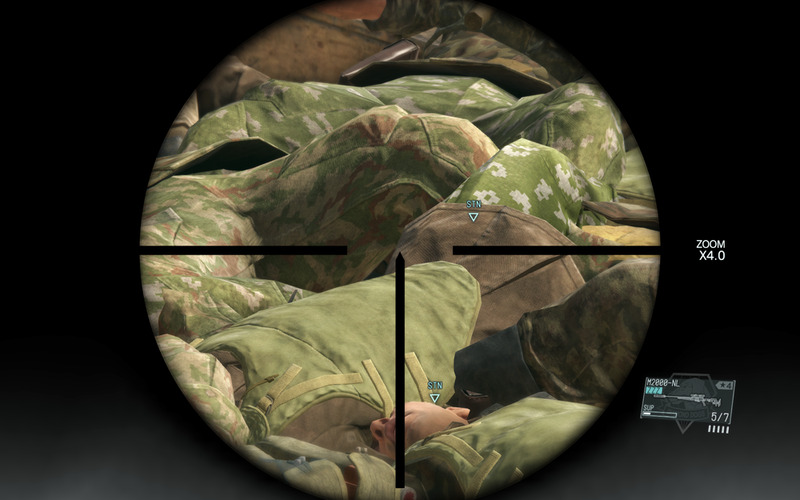 Creating this body pile presented a real dilemma as I was not sure how to incapacitate the soldiers to put in it. If I were to knock them out, it turned out they would not actually stack on top of each other but instead lie flat on the ground with no collision with each other. On top of that, in MGS V unlike many other games like Dishonored or Hitman, unconscious people can actually wake up on their own. This meant that the body pile would have to be constantly monitored and maintained. Unlike Slime Rancher, where the game's design encourages maintaining a collection of agential creatures and affords tools specifically for this purpose, in MGS V maintenance would be cumbersome and awkward. I ended up going with the unconsciousness route, as you can see in the video, because the lethal option was even worse. When enemies are killed in MGS V, the game will slowly despawn (essentially, delete) the dead bodies that are no longer on camera, meaning a body pile would be functionally impossible. In MGS V, for the sake of the game running smoothly, bodies can only stick around if they have a chance of rejoining the game world in a meaningful way by waking back up. Dead bodies can still be discovered by other guards, but their function is much less dynamic and thus their very existence is limited. Their tangibility has a direct relationship to their threat to the player. Something that may seem a little bit strange to those who haven’t played MGS V is that multiple times in the video I throw a body that I’m carrying into the pile on the ground, causing all of the unconscious soldiers there to react but stay asleep. This is because even though unconscious bodies do not collide with each other in MGS V, too busy snoring and acting out their sleep animation, they do react to thrown bodies. Any character, awake or asleep, hit by a thrown body in MGS V is knocked unconscious. When I throw unconscious bodies into the pile that I am creating, it is to keep all of the people there asleep in one motion, basically, resetting all of their "sleep timers". Normally this mechanic would only be used for a combat situation, but here I use it in a way more akin to watering plants, as a maintenance activity. The bodies in the pile are bodies without agency, and they are governed not by physics (they do not collide with each other), but instead by animation until the point they are hit by a thrown body, where they then briefly do care about collision and reapply the “stunned” status. Then, they revert to not colliding with any other bodies- even with the thrown body that just had a collision with them! A way to think about this is that in MGS V, a body held or thrown is considered by the game’s backend to be something totally different than a body represented on the ground or in a pile. It’s the act of throwing that transitions them from a weapon, or projectile, into a represented body. While to the player the body of the unconscious guard seems to stay consistent, on the backend its data body is being reconfigured and compartmentalized. The player has the ability to not just transition bodies from life to death, or life to unconsciousness, but on a data level transmute them from fully from one type of "thing" to another. This is a powerful kind of transformative power, and one that is often hard to see because on the aesthetic side, these bodies appear the same. It's only in examining this extreme practice do these transformations become a little more visible and explicit.